Believe it or not, the map has changed drastically since the land reclamation in the 1980s. Just by looking at the northern coastal line of Hong Kong Island (the side facing towards the Kowloon Peninsula), it was very irregular, but, now smoother or more of a straight line. I bought this book, AIRPORT OF THE NINE DRAGONS KAI TAK, KOWLOON, on the closing day of the Hong Kong Old Airport (coming soon, link to Hong Kong Old Airport page). 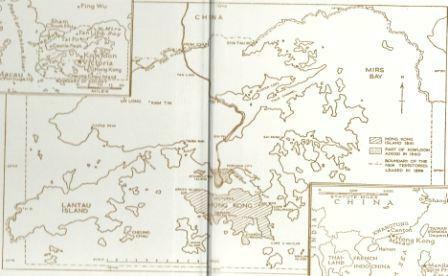 And it has this old map of Hong Kong showing you the rough edges on the coastal line. Map from the Book "Airport of the Nine Dragons Kai Tak, Kowloon"
Have you ever thought about how the historical map of Hong Kong looked like? I came across this map in Wikipidea. It was so amazing. 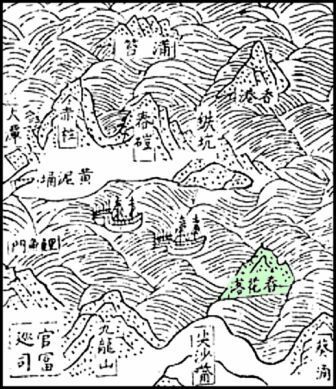 Although this map was written in Chinese, there were several familiar Hong Kong names, such as Kwai Chung, Stanley and more. 1) Two IFC Tower, the tallest building shown on facts-about-hong-kong.com logo, check out our Hong Kong Entertainment page. 2) Hong Kong Convention and Exhibition Centre, this building was the scene of one of the most important moments in the history of Hong Kong, the Handover, the building shown in the middle on facts-about-hong-kong.com logo, check out our History of Hong Kong page. The setback of the reclamation is that the Victoria Harbour between Hong Kong Island and Kowloon Peninsula is getting narrower and narrower. This picture (above) was taken in early December 2007. This area was originally the Star Ferry Station. At the time of this picture taken, it was under the process of land reclamation. 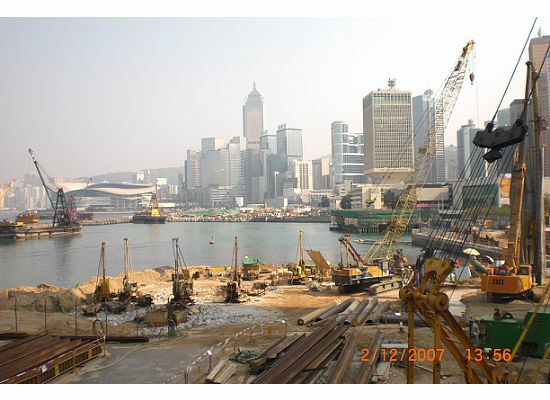 As of Oct 2012, there is an extensive land reclamation project going on in the northern part of the Hong Kong Island. The picture shown above is part of this project. The scale extends from Central to North Point. 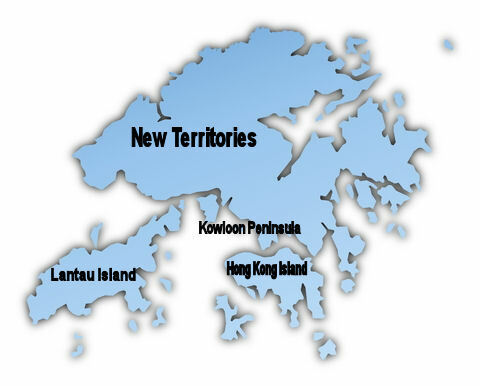 So, do expect that the map of Hong Kong will change drastically in the next 5 years or so. You may wonder where they get all the soil for such large scale projects. We are talking about totally changing the shapes of whole islands. Other than buying the material, a lot came from leveling off some of the hills in Hong Kong. One very good example is where my mom lives. Where her apartment building is situated used to be a big hill with fully grown trees. I still remember when we drove by in my childhood, there were many, many excavation machines. There were no buildings. Now, there are 2 commercial buildings, MTR stations and more than ten 20-storie buildings. Like the buildings in front of my high school and Victoria Park were built on the reclaimed land. 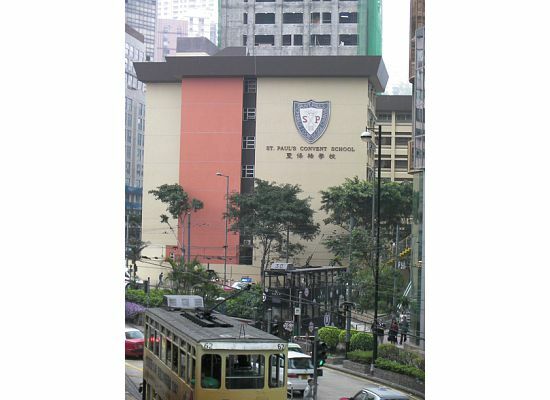 As shown in the picture below, the old school building was built behind this new one. It was torn down between late 1984 & early 1985, the first year I started in this school. It witnessed some of the down time of the History of Hong Kong. Map of Hong Kong only gives you a very brief idea of this tiny, but significant world top financial city a peek in relation to the rest of the world. 2) World Map Hong Kong - Where exactly Hong Kong is located? What are the shortest route to go there from where you live? 3) Hong Kong Road Map - The main infrastructure built by the Hong Kong government connecting 235 iislands together. 4) Hong Kong Street Map - Stepping into the heart of the city and see it looks like in front of your eyes. 5) Hong Kong Map - Precisely at what location to do what? Shopping, dining, touring and more. When my grandfather, a guy knew nothing about English, traveled to the States all by himself to visit his children, he always brought a set of Chinese-English kids flash cards with pictures in order to help him to communicate. Like when he wanted to have a cup of coffee, he could show a flash card to a wait staff. Recently, I found this set of flash cards,Learn Chinese - Flash Cards for Beginners, are very helpful for people like my husband, Perry, to get around the island. It has most of the basic words that you need in the trip.